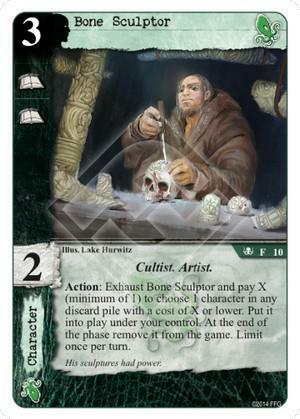 ￼Action: Exhaust Bone Sculptor and pay X (minimum of 1) to choose 1 character in any discard pile with a cost of X or lower. Put it into play under your control. At the end of the phase remove it from the game. Limit once per turn. Flavor Text: His sculptures had power. Is this supposed to appear twice? I suspect he was mis-entered as being in the core, then they noticed him missing and entered him again, then they noticed the core version and change it to the correct pack and now we have two listed in the pack.